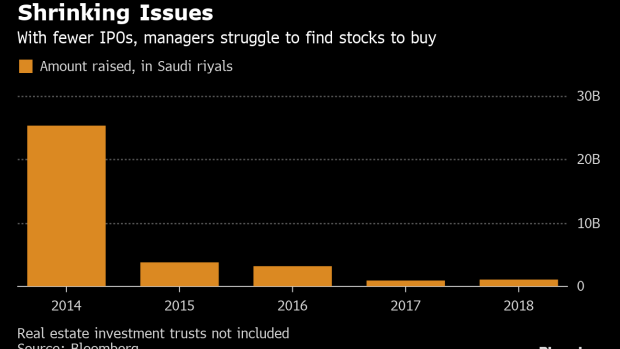 (Bloomberg) -- Betting on initial public offerings in Saudi Arabia in the past few years has proven to be a bad idea. Not too long ago, funds focused on buying IPO stocks boomed in the kingdom as regulators implemented reforms aiming at increasing institutional participation in the Arab world’s biggest equities market. In 2015 alone, 16 such pools were created, with total assets approaching 4.9 billion riyals ($1.3 billion). Most of them had a mandate to invest in new stocks sold locally in their first three years of trading. A fast-forward in time exposes a bleak scenario. More than a third of the funds created in that year have already been liquidated, and total assets under management for those active plunged more than 80 percent to around $207 million. Not a single one of the pools still open has delivered a gain in the past 12 months. That’s a sharp contrast to the overall performance of the main Saudi equities index, which is up 16 percent in the past year. The potential sale of a stake in giant oil producer Saudi Aramco, expected to take place in Riyadh and on a bourse abroad, would be the biggest IPO ever and a game changer for the category of funds. But it has been postponed after international investors balked at Crown Prince Mohammed bin Salman’s $2 trillion valuation. As local investors and analysts remain skeptical of a pick up in new issues, the funds could soon become an obsolete product, according to John Sfakianakis, chief economist at the Gulf Research Center in Riyadh. --With assistance from Heba Abu Yousef and Yasmina Daou.